4 Best Ways To Smile With Confidence - Including Invisalign In Newark! 4 Best Ways To Smile With Confidence – Including Invisalign In Newark! Do you find yourself covering your mouth when you smile or laugh (or worse, not smiling at all) because you’re embarrassed of your teeth? That’s no way to go through life! Why should a lack of confidence hold you back from reaching your personal and professional goals – especially when cosmetic dentistry makes it so easy to have a smile you can be proud of. Whether you want to straighten your teeth with Invisalign in Newark or repair chips, cracks or stains, getting a smile makeover is easier than you might expect. Keep reading to learn about 4 of the most popular procedures and how they can help you! Whitening is one of the most popular cosmetic treatments, which is no surprise because it’s a simple, affordable procedure that really transforms a smile. Just by wearing custom-made trays at home for 30 minutes a day (for about 2 weeks), you can safely and reliably brighten your teeth from 6-10 shades. If there’s one cosmetic procedure that can (practically) do it all, it’s porcelain veneers! These thin, strong “shells” are adhered to the front of the teeth to give them a brand new appearance. Using the same white filling material that’s used to repair cavities on the back teeth, cosmetic bonding is a great way to mask small imperfections on the front teeth. First, the shade is matched to your existing color and then the material is smoothed to cover a wide variety of imperfections such as chips, cracks, small cavities and discolorations. What’s the First Step Towards Getting a Smile Makeover? For some patients, a whitening treatment is all that’s necessary to transform their smile. For others, a combination of procedures is ideal. 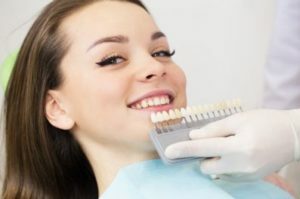 Since everyone is unique, the first step to getting a smile makeover is scheduling a consultation with a cosmetic dentist in Newark. Dr. Donald Bond is a general and cosmetic dentist in Newark who wants all of his patients to have the self-confidence then need to have a great quality of life. He always takes the time to thoroughly evaluate his patients’ needs and explain different treatment options to help them make the best decision. If you want to enhance your smile and have any other questions, he can be reached via his website or at (302) 731-4225. Comments Off on 4 Best Ways To Smile With Confidence – Including Invisalign In Newark!